A second floor apartment with sea views, a short walk away from the beach in Bundoran, with two bedrooms accommodating four people. 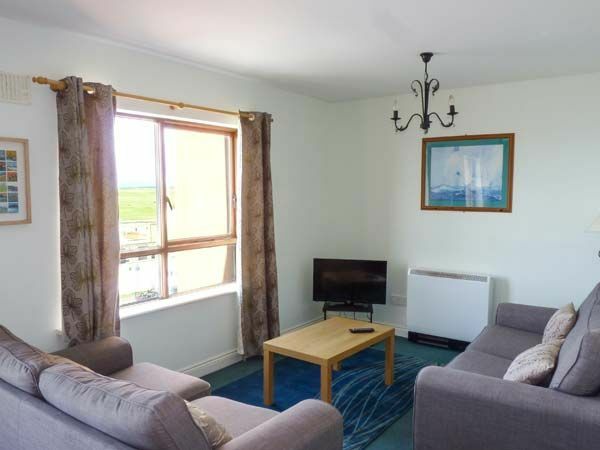 Atlantic View is a second floor apartment in Bundoran, County Donegal. The apartment has a double bedroom with an en-suite, a twin room and a separate bathroom meaning it can comfortably accommodate four guests. There is an open plan living space with a kitchen, a dining area and a sitting area, plus views of the sea and beach across the road. You can park in the car park outside the apartment on a first come, first served basis and with lots of wonderful things to do nearby, Atlantic View is perfect for a break by the sea in North West Ireland. Amenities: Electric storage heaters. Electric oven and hob, microwave, fridge, washing machine, dishwasher, TV with Saorview. Power charged by meter reading, first 20 inc. in rent. Bed linen and towels inc. in rent. FOC parking for 1 car in car park outside apartment on first come, first served basis. Sorry, no pets and no smoking. Shop, pub and beach 5 mins walk. Region: The West of Ireland conjures up many images; thatched, whitewashed cottages, a flock of sheep on a narrow road, an emerald green field with a stone wall, or the Atlantic waves crashing into towering cliffs and rocky shores. Town: Bundoran is a coastal town in County Donegal, which offers an annual folk festival, shops, pubs, restaurants, golf course, adventure park and cliff walks. The town of Ballyshannon is only four miles away and is well worth visiting. There are many attractions in the area to keep everyone occupied. All second floor. Two bedrooms: 1 x double with en-suite shower, basin and WC, 1 x twin. Bathroom with bath, basin and WC. Open plan living area with kitchen, dining area and sitting area. Electric storage heaters. Electric oven and hob, microwave, fridge, washing machine, dishwasher, TV with Saorview. Power charged by meter reading, first €20 inc. in rent. Bed linen and towels inc. in rent. FOC parking for 1 car in car park outside apartment on first come, first served basis. Sorry, no pets and no smoking. Shop, pub and beach 5 mins walk. Appartement agréable mais pas entretenu. Appartement agréable bien exposé avec jolie vue. Ménage et entretien laissant à désirer - mouchoirs papiers et morceaux de gâteau sous les lits à 1 personne, environ 1 cm d épaisseur de graisse type végétaline dans l unique poêle. Le plus important est l étroitesse du lit à 2 personnes puisqu il mesure 1m20!!!!! Dans une salle de bain il y a une baignoire mais pas de pommeau de douche! et dans l'autre, le lavabo est de la taille d'un lave mains et à hauteur d un enfant! Aucun rangement dans les chambres car les armoires n ont aucune étagère mais une seule barre avec 3 scintres et le bureau de la petite chambre est inaccessible car trop exiguë ! C'est dommage car c'est un bel appartement mais pas entretenu.